L-R: Tai and John Beldock, Erico Motorsports; Mrs. & Mr. John West; Laurie Montoya, BikerDown; Scott O’Sullivan, The O’Sullivan Law Firm. Thanks to The O’Sullivan Law Firm, BikerDown recently benefitted from another motorcycle giveaway! Starting last spring, hundreds of people registered to win the bike and, in the process, they also learned about our important nonprofit. Then, on Saturday, September 23, we all gathered at Erico Motorsports to see who would ride away on a new motorcycle. Everyone was so excited! Over 100 people braved the driving rain to gather at Erico Motorsports to witness the final stage of the Triumph Motorcycle Contest. In addition to the 10 pre-qualifiers drawn from advance registrations, we drew another 10 names from those who came to the event. That meant 20 people would have a set of keys to try to start the bike. We lined up the 20 qualifiers, they drew keys and attempted to start the bike. And the winner was…..
John West! And the best part was, John really needed this bike! His motorcycle was recently totaled in an accident! And how did BikerDown benefit? 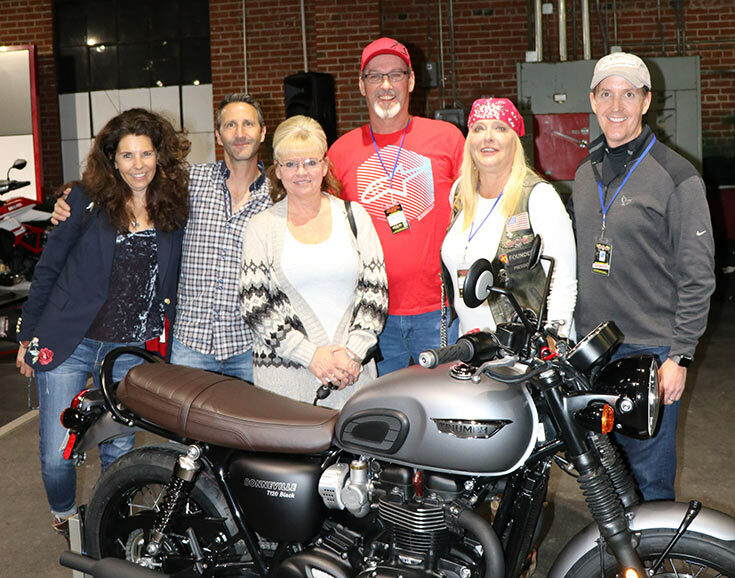 In addition to the exposure to hundreds of new riders that the organization received over the past six months, BikerDown received cash donations at the event. I have a feeling that Scott and The O’Sullivan Law Firm will continue supporting our organization with giveaways. If you’d like to be included on their mailing list, contact them at [Chere, how should they do this?] You never know… you could be the next big winner! By early June of 2017, BikerDown had already received 42 help requests from injured riders and their families. Of those, 15 were from out of state. We helped those riders connect to other accident survivors, pay for rent, find medical equipment and generally provide BikerDown love and support. I’m blown away by how many bikers are being hit by cars making left-hand turns. It has to be due to distracted driving. One of our calls was from a biker who was hit by a car and the rider lost a leg due to the accident. While he was still in the hospital, we introduced him to Randy of Randy’s Run for Fallen Bikers. Randy, who also lost his leg in an accident, went to the hospital to meet this newly injured rider and to provide much-needed support. Randy was able to show this rider that life was not over. The rider and his family desperately needed this support. We also received a call from a rider who was in Grand Junction and was hit by a car. Calls also came in from Texas, California and Arizona. Four riders lost their legs in May alone! The lost appendages happen as a result of car drivers making left-hand turns in front of bikers. When they cross in front of the biker, who has little or no time to react, the biker is often hit on their leg or their bike falls on their leg. If a biker is riding legally and calmly down a road and a car makes a left-hand turn right into him, what options does he have? Or if he’s sitting at a stop light and a car runs right into the back of him, what are his options? None. Even at 15 miles per hour, the biker will sustain significant damage to his bike and body. It’s just mind-blowing to me how many cars run right into bikers. Again, I believe this is due to distracted driving. If you’re fooling with your phone or GPS, reaching for food, or yelling at your kids in the rear-view mirror, you’re distracted. Recently, we paid one month’s worth of rent for a biker whose savings were wiped out by his medical bills. In order to provide all of the support we do, we rely heavily on gifts and grants from others. Luckily, we recently received approximately $22,000 from a BreadBoost contest. Thanks to several very generous supporters, including Rocky Mountain Harley-Davidson, we made it through two rounds of the contest and our winnings were high! We are also in the running for a $5,000 grant from the Granger Foundation. I am seeking more and more grants to help fund our important work. However, we also rely on individuals like you for support. Please consider becoming a member of BikerDown or simply make a gift in support of our efforts. I promise that I put every dollar to good use in support of your fellow riders! Last but not least, have you heard about the giant new bike event being launched in Fountain, CO from June 21 through 25? 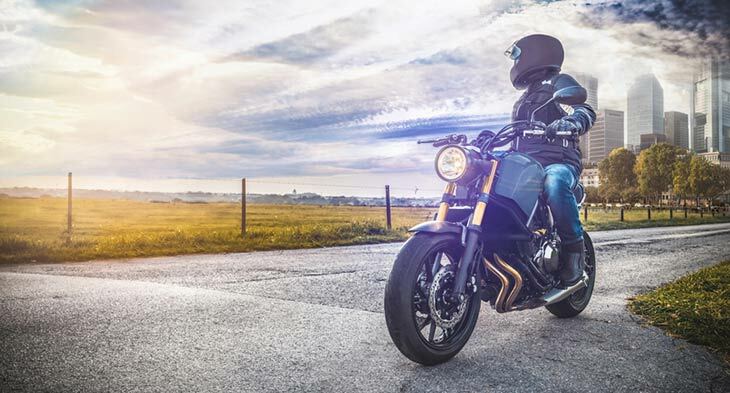 The O’Sullivan Law Firm, which is a supporter of BikerDown, is sponsoring the event, called Pikes Peak Bike Week (PPBW), and it’s going to be huge! BikerDown is going to have a booth there with all kinds of prizes, freebies and other fun stuff. Thanks to Scott O’Sullivan, BikerDown will have a booth at PPBW so that we can spread the word about our important mission and also help register people to win a 2017 Triumph Bonneville T120! The O’Sullivan Law Firm has teamed up with Erico Motorsports to give away this fantastic bike and they’re throwing in another $500 to use at Erico Motorsports for accessories. The total value of this grand prize is $12,500. To register for this year’s motorcycle giveaway, all you have to do is visit our booth at Pikes Peak Bike Week and sign up! You can also visit the registration website where you can register once a week every single week until the drawing in September. This contest is open to Colorado residents who are 21 years of age and older. Registration is free and there is no purchase necessary to enter. That’s all I have for now. Please ride safe this summer and come see me at Pikes Peak Bike Week!